Many years ago, one of the things that first attracted me to the Mac were its customizable desktop patterns. Walking past the machines in the lab, the unique look to each Mac’s desktop was a definite eye-catcher. Fast-forward some number of years, and desktops are no longer patterns, but gorgeous full-color images that can be automatically changed at certain intervals. While this eye candy makes it more pleasant to stare at our monitors all day, there is one downside—desktop icons can sometimes be obscured, especially by desktop pictures that are lighter in tone. Enter DeskCover , a free program that adds a customizable background behind the icons on your desktop. Some desktop images (top) make it hard to discern the desktop icons. With DeskCover running, though, the icons are clearly visible (bottom). When active, you’ll see a DeskCover icon in your menu bar; click it to open the program’s preferences or to quit the program—and that’s it as far as the functionality in the menus. The preferences screen isn’t much more complex. 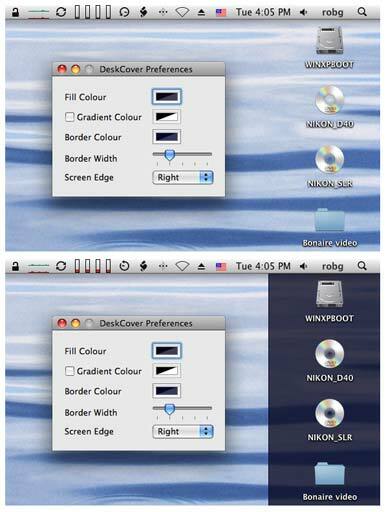 Here you specify the color to fill behind the desktop icons, whether or not to use a gradient fade to that color, the color and thickness of a border line at the edge of the filled-in color, and against which edge of the screen you’d like to anchor the fill color. Choose a color scheme you like, and that’s it. DeskCover isn’t just a static background, though. As you move icons onto and off of your desktop, DeskCover is always watching. If you add an icon that creates a new column of icons on the desktop, the size of the background image automatically adjusts to the necessary width—and it does so with a subtle but nice animation. About the only thing that tripped up DeskCover was when I used the Finder’s preferences panel to change which icons were shown on the desktop. When I added all my hard drives, DeskCover didn’t recognize the newly-added row of icons. Simply toggling a change in DeskCover’s preferences, though, caused the extra row to be identified, and the background cover then expanded as necessary. DeskCover isn’t rich on features, but it doesn’t have to be. It does one thing, does it very well, and you can’t beat the price.